This time the Novemberfest conducted by The Hindu is turning out to be a dull affair for people like me. 4 concerts featuring North-Indian music including one where South Indian singers, Chinmayi, Anuradha Sriram, Srinivas and Naresh Iyer are singing old Hindi songs. I missed last year's Tirlok Gurtu's performance and was hoping for something similar this year but it has only been a disappointment so far. Spyrogyra the prog-jazz/modern jazz band play at Bangalore on the 23'rd of this month. 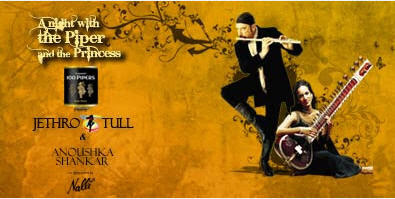 The Jethrotull and Anoushka Shankar concert titled A night with the Piper and Princess is on Decmeber the 2'nd. You can book your tickets at www.bookmyshow.com from where I took these images. But I'll save the best for the last. 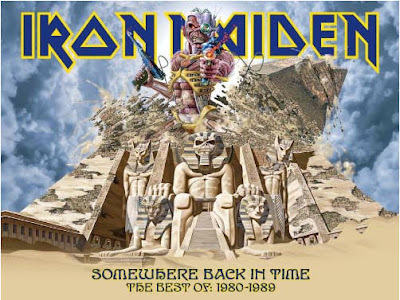 On February 15'th, 2009 Iron Maiden is back in India and at Bangalore playing their hits from the past in their "Somewher back in time" tour. I may go for this one but I hope instead of going alone I have some good company in old friends. Shaji, TP, Binny are you reading this?